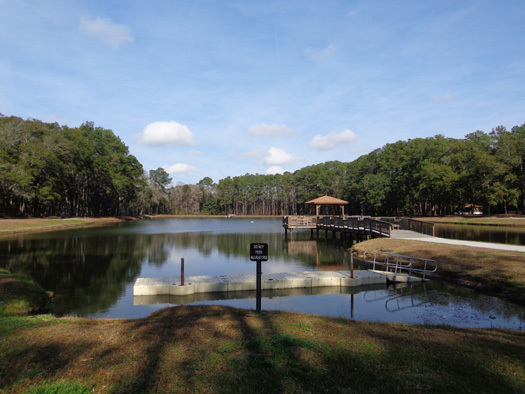 hunting and fishing licenses at both Hunter and Fort Stewart." 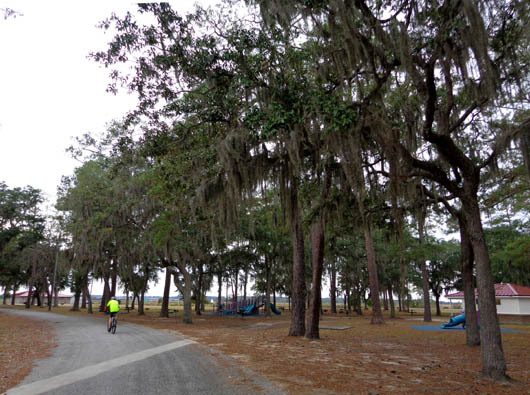 Although we don't fish or hunt, the Lotts Island RV Park looked like it would be our best option for camping one or two weeks in the Savannah area. 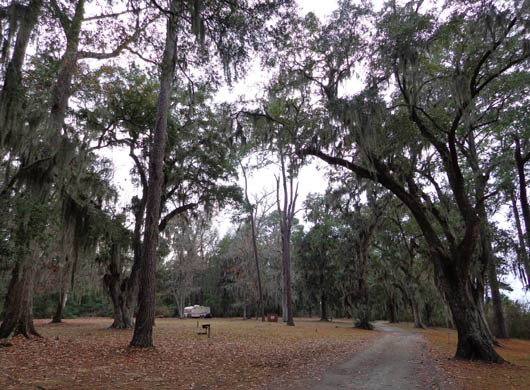 Fort Stewart also has a campground but it's located significantly farther from downtown. Jim always consults the Military Campground website when we're making travel plans. 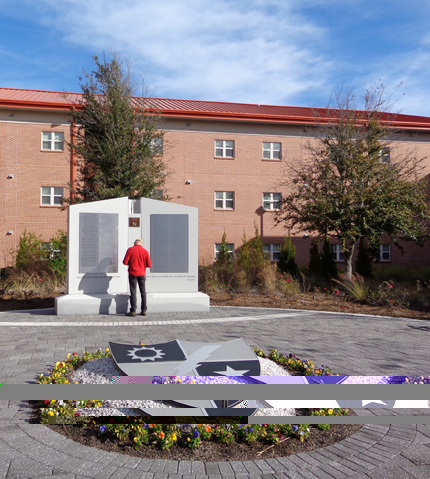 If there's a military post or base near our destination, it quite likely will have a campground for active duty members of the armed services and military retirees. 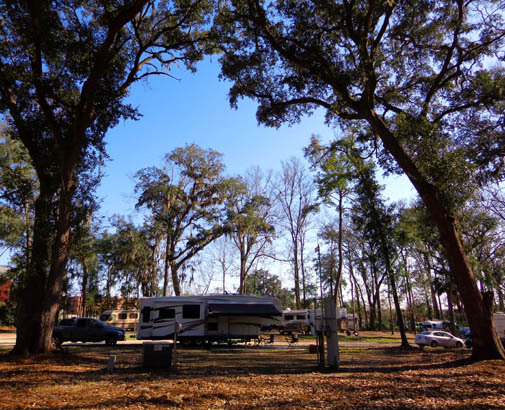 These campgrounds have partial to full hookups and are usually less expensive than public or private campgrounds in the area. Several weeks ago Jim made a reservation for a site from January 9-16. 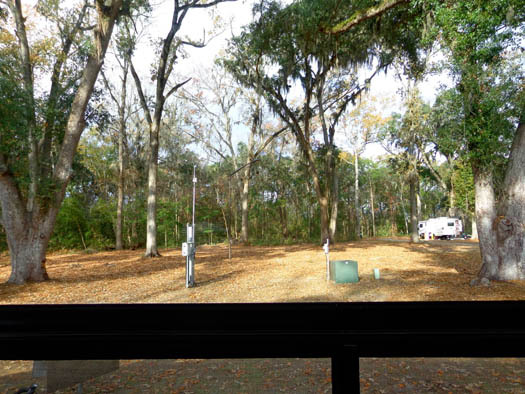 Although not all the online reviews for this small campground have been positive, we've enjoyed being here well enough -- and needed more time to see things in the Savannah area -- that we asked to extend our stay for another nine days. Since the campground hasn't been completely full any night we've been here, we were allowed to extend two days beyond the normal limit of 14 days. I'll talk more about the pros and cons of this RV park in a little bit. This is the first time we've played snowbird in Georgia and Florida. For reasons explained in the last entry we got a later start than usual on our winter trip and it just didn't seem very practical to haul the Cameo from Virginia to the desert Southwest this time for fewer than three months. Heading to Florida still gives us the opportunity to bask in warm sunshine under palm trees. We were happy to start seeing palmetto trees and cotton fields in South Carolina at the end of the first day on our drive south, much sooner than it would take us to reach Arizona. The drive from our house in southwestern Virginia to Savannah, our first destination, was a relatively easy one-day drive for us. Because we now have a five-month-old puppy named Casey, however, we decided it'd be less stressful on all of us -- including our older dog, Cody -- to divide the trip into two shorter days on the road. is to the left; Casey is sitting behind the driver's seat. She has plenty of room to lie down. The temporary divider was Jim's great idea to give Cody some peace. I didn't think it would work but it did. The first day (Tuesday, January 8) we drove from our house on hilly two- and four-lane highways through Greensboro, NC to Florence, SC. We parked overnight at the Walmart and Sam's Club near I-95 on Beltline Drive. Those are Army Humvees being transported on the flat beds, possibly headed to Fort Stewart. 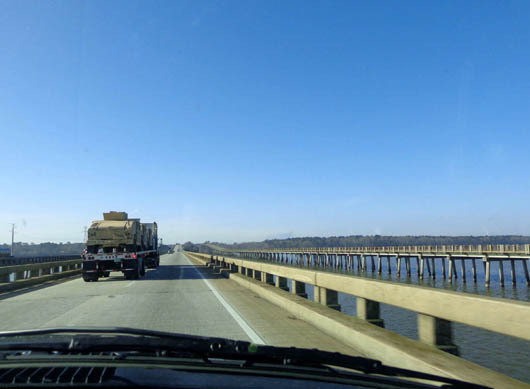 The second day in eastern South Carolina and coastal Georgia to Savannah was much flatter and partially on freeways. We knocked out the miles rather quickly. 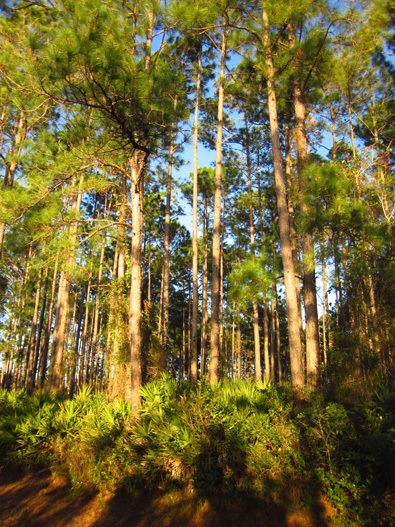 We saw an increasing number of palm trees, large live oak trees with Spanish moss, and swampy areas as we drove south. 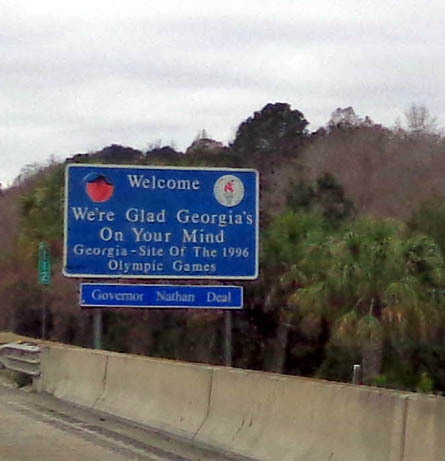 It's a pleasure to be back in Georgia, a state where I lived for 25 years. The weather was warm and mostly sunny both days, perfect for travel. 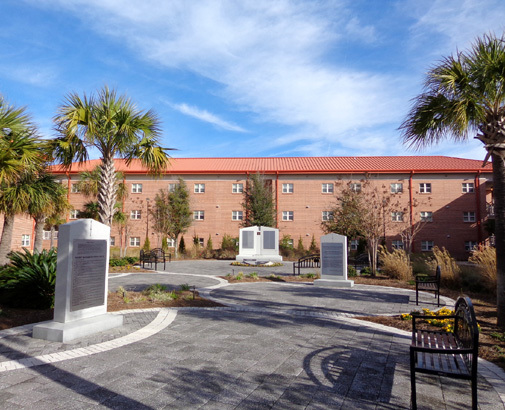 The weather has been above average temps since we've been in Savannah, with highs in the 70s and low 80s F. Love it. Temps are supposed to be in the 60s F. the rest of the time we're here, which is more like normal. That's still more pleasant than most of the rest of the country this month. We've really enjoyed all the warm sunshine in January. That's what this "snowbird" thing is all about! 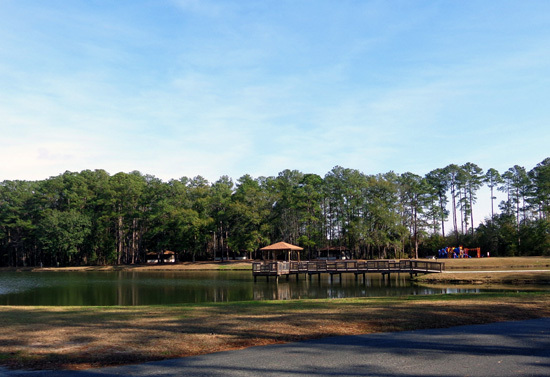 The RV Park at Hunter Army Airfield is located close to the Rio Gate at the southern end of the post. Unless you already have a pass for this specific post, do not drive your camper in this gate upon arrival! That's the gate the website directs campers to use but it doesn't say you are required to have a pass to enter there. I saw the guards deny entry to a couple RVs at that gate. They had to back up onto the busy street and drive halfway around the post to the correct gate, then all the way through the post to reach the campground. 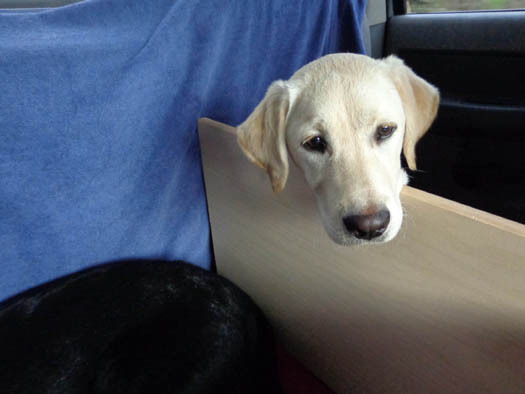 The occupants weren't happy when they finally reached the campground! over this stream in search of it. Good thin it's scenic and has a turnaround! We didn't have a pass for Hunter before our arrival. Fortunately Jim learned from other peoples' comments on the Military Campground website that we needed to use the more-distant Montgomery Gate the first day, then get a pass. After that we could use the more convenient Rio Gate on most of our forays off-post. We did run into our share of problems finding the campground, however. We got through the Montgomery Gate OK but had great difficulty following the guard's directions to the campground. He didn't have a map to give us and we never found one online to print. We drove several miles out of our way, getting an unexpected tour of the post, before turning around in a flat, grassy field near a runway and finally finding our way to the campground. There is no sign directing folks to turn on a little paved road to reach the campground entrance. We saw campers in the distance and intuitively turned at the last road right before the Rio Gate. I watched more than one RV mistakenly drive out to Lotts Island before returned to the campground. MWR is closed on Tuesdays and Wednesdays. We arrived on a Tuesday. There was no campground host to tell us where to park. We finally found another camper who told us to just find the site we preferred and park there. 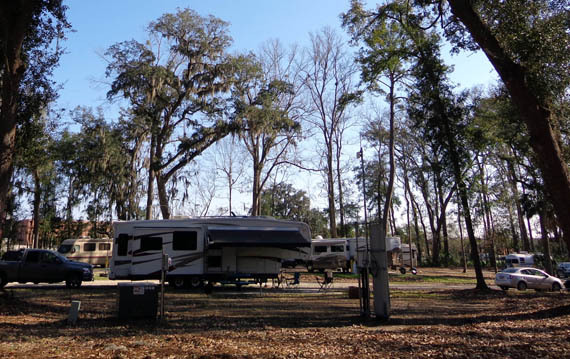 Most of the sites in the regular campground are pull-thrus, including the one we chose out of the seven unoccupied spaces. We have a concrete pad for our picnic table. We also have a grill and fire pit. The camper sits on a level bed of gravel. There is dirt with some grass and a lot of leaves in our "front yard," which stretches at least 100 feet to the woods. We chose our site because it was easy to get into, not as close to other campers, next to the WiFi tower, and has plenty of room for the dogs. I love the shady half-circle path through the thick woods, a great place to walk Casey and Cody first thing in the morning. We have 50-amp electrical service, good water pressure, and a sewer. We have five Verizon bars for our phones and MiFi. The free WiFi is pretty useless at all the sites. Even though the WiFi tower is only 15-20 feet from our front door the signal is very weak inside or outside of our camper. Some sites have cable but ours doesn't. Without it we are still able to get CBS, NBC, ABC, PBS, and other stations clearly on the TV. The cost is $22/night but with the NPS Golden Age Pass we get $4 off. We've never been able to get a national park discount at a military campground before, so that's a nice bonus. There is no weekly or monthly rate. Overflow, with no hookups but water available, costs $6/night. Since MWR was closed the first two days we were here and there is no campground host, we had to find out some information from our fellow campers -- including the password for free WiFi. Unfortunately, hardly anyone is able to get online because the signal is so weak. When I've seen some other RVers come in and have no clue where to park I've gone out to answer their questions. It would have made our arrival easier if someone had done that when we got here. Those few complaints aside, we like our campsite, the trails and roads on base to walk and ride our bikes, and the convenience to shopping and historic areas -- Target, Walmart, Petsmart, Lowe's, Home Depot, and some other big box stores are very close, and it's only a few miles to the historic area downtown. 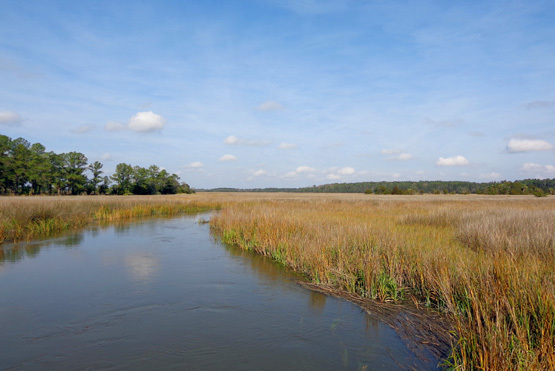 Savannah and environs are easy to navigate. We've had fun exploring the post on foot and bike. 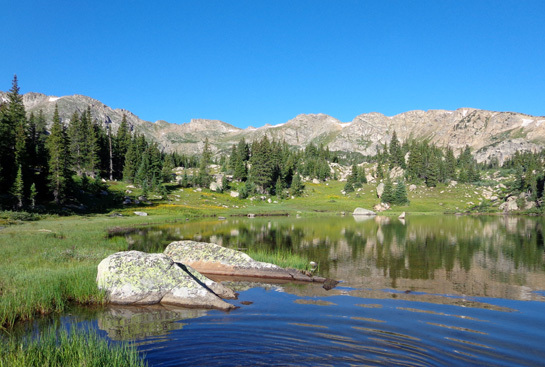 We saw a nice park (Hallstrom Lake Recreation Area) and several bike trails when we were hunting for the campground the first day we arrived. After we got set up and ate lunch that day we both got out to explore. We soon found lots of miles of paved and dirt roads and trails to keep us busy for 16 days. Jim rides the loop through the picnic area on Lotts Island. some fast miles with minimal traffic and few stops. Jim rides his bike almost every day from 10 to 50 (yes, 50!) miles. He saves his longest rides for weekend days when there is less traffic on post. He's very motivated to train now, with a major 100-mile mountain bike race coming up in August. I've gone out with him a couple times on his shorter rides got about ten miles. My main physical activity is still walking, however. 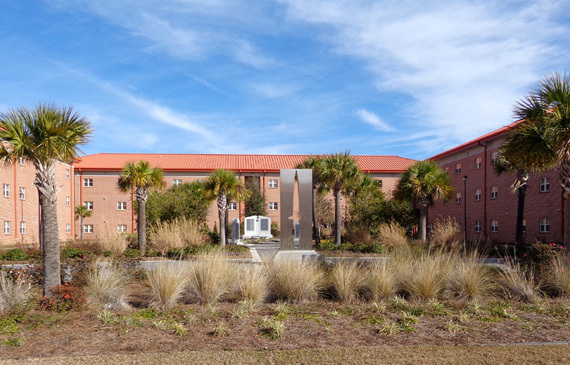 Click here for more information about Hunter Army Airfield. Every day I walk the dogs separately for two or three miles each. I can go three directions right from the campground -- around a short dirt loop in the woods next to the campground, out and back on the paved bike path, or over to Lotts Island on a paved road. 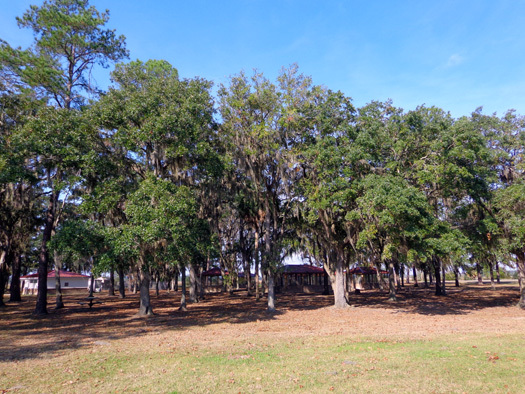 The picnic area has playground equipment, shelters, and restrooms. 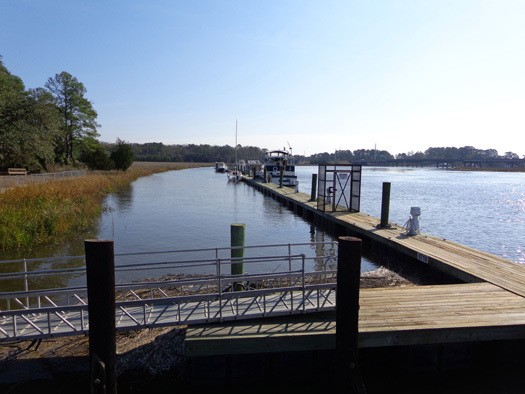 Part of the fishing pier on Forest River; there is also a marina and large, covered and screened shelter. 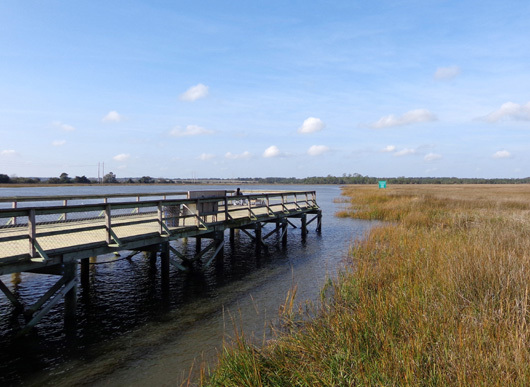 Because of all the nearby water MWR at Hunter Army Airfield rents boats to interested members of the military, including retirees. They also rent RVs and have a storage area for active duty folks who own boats and campers. It's unfortunate that I can't let the dogs swim in the ponds, streams, or wet areas on post -- there are alligators lurking all over the place. They won't get to swim much this winter except in the ocean. 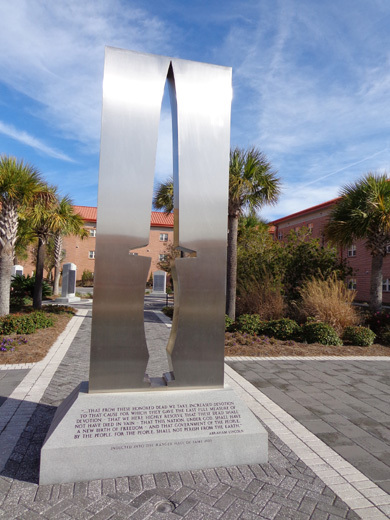 We've taken the dogs with us on some of our driving and walking tours in historic residential areas of Savannah. 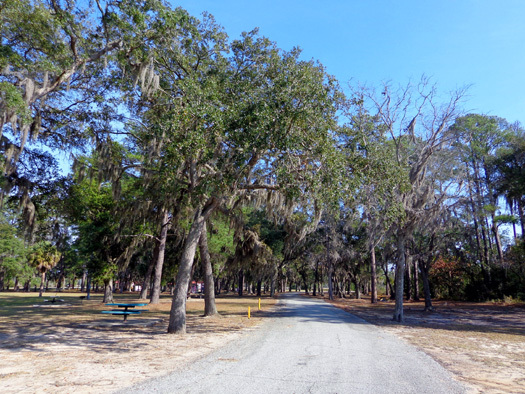 We also took them for walks in some of the city parks, around the historic squares, along the waterfront, and on the dirt trails at Wormsloe State Historic Site. 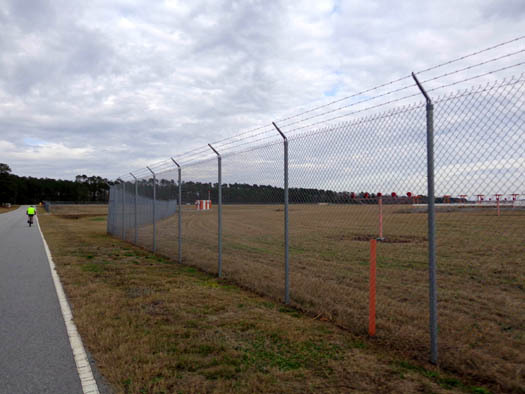 We drove by a couple of fenced dog parks in Savannah but didn't see anyone using them at the time so we didn't stop. Casey needs some other dogs to play with. She's big enough and rough enough that Cody doesn't like playing with her much any more.